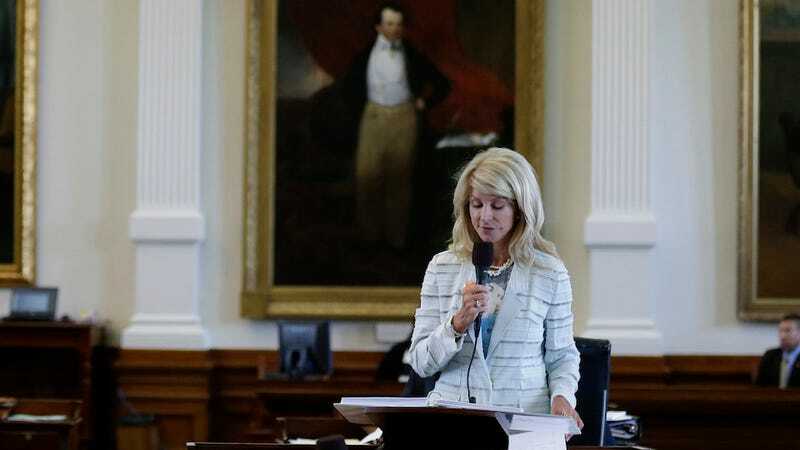 Since her badass 13-hour filibuster in 2013, Texas gubernatorial candidate Wendy Davis has more or less become the face of abortion and broader women's rights in Texas. In her upcoming autobiographical novel, Forgetting to Be Afraid: A Memoir, Davis reveals her personal experiences with abortion, having terminated two pregnancies for medical reasons. After getting several medical opinions and feeling the baby they had named Tate Elise "tremble violently, as if someone were applying an electric shock to her" in the womb, she said the decision was clear. "She was suffering," Davis wrote. The unborn baby's heart was "quieted" by her doctor, and their baby was gone. She was delivered by cesarean section in spring 1997, the memoir says. Davis wrote that she and her then-husband, Jeff, spent time with Tate the next day and had her baptized. They cried, took photographs and said their good-byes, she wrote, and Tate's lifeless body was taken away the following day. "An indescribable blackness followed. It was a deep, dark despair and grief, a heavy wave that crushed me, that made me wonder if I would ever surface. ... And when I finally did come through it, I emerged a different person. Changed. Forever changed," Davis wrote. The book comes out next week on September 9.